What year is my Spitfire? The question about what year your car "is" is a complicated question for many reasons. (I will use 1974/75 as an example). Check your commission number against the charts in this link. Example: if your number is FM29851U then your car is a "1975" Spitfire. The comm number is located on a metal plate riveted in different locations depending on the year of your car. The Commission plate is most often located under the car's bonnet (hood) on left side of the body photo and will look similar to this photo. Of course your commission number will be on your title (but will probably be listed as a "VIN" number). 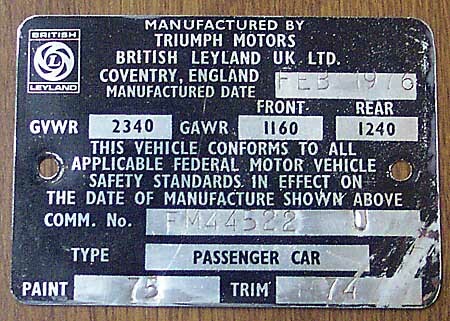 Right now the only way to get the exact date the car was BUILT is to have a British Motor Industry Heritage Trust Certificate processed. A company in England still has most of the original factory records about many British car and will send you a copy for approximately $50. Model Year: cars that were built up to Sept 74 were 1974's... after Sept 74 they were "1975" models (the car had 1975's required parts). The factory built "next year's" models starting a few months before that year actually got there. That way all the dealers had 75's on the lots when 1975 actually rolled around. If the cars arrived to the dealer's lots early, in December 1974 for example, the car sitting there was a "1975 Spitfire" built to 1975 specs. Marketing: during that time cars were often marketed as the next year's model. For instance, the dealers would advertise "get your 1975 Spitfire now!" (in late 1974). Helped sell cars during a slow selling time (Christmas). And again the car was built in 74 built to 75 specs and designated as a 75 model. "Shady" Dealers (at least by today's thinking): back in the 60's and 70's the dealers would title a car as the year it was SOLD not MADE. 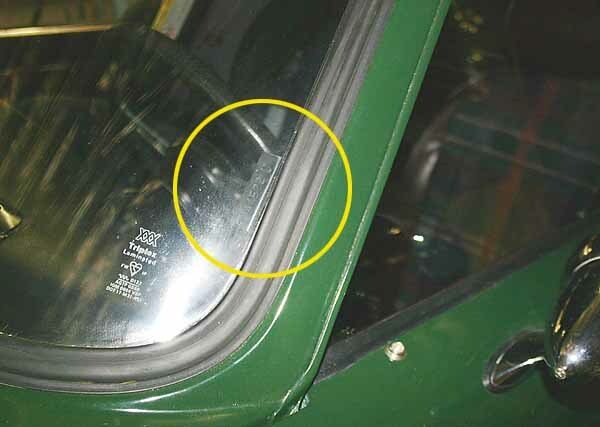 If a car was built in Dec 73, was stuck in UK shipping yards due to a dock strike for 5 months (this happened a lot), shipped over the next month to the US, then it might sit on the dealer's lot for the rest of 1974. If it sold on Jan 1, 1975, the title says the car is a 1975 Spitfire. The car is really a 1973 Spitfire with 73 parts not a 75. Do you blame the dealer? How would the dealer ever sell a car, that was made in 1973, in 1975? He wouldn't. But he would be able to sell a "75". Parts Swaps: Now add in the fact that these cars are so interchangeable between years that previous owners would often swap parts from different years. You can swap a MkIII bonnet on your MkII. The car will look like a MkIII but be a MkII. Take this concept a little farther...how many parts can you still swap from another year and still keep the the original year? A philosophical question that everyone seems to have a differing opinion. My "76" has every part replaced from my 75 parts car except the frame, tub and engine block. Imagine if I wreck the car and have to replace the frame and tub? Is it still a 76 when the only thing original is the engine block and commission plate? According to the DMV, yes. So the question about what year your car "is" boils down to, as Bill Clinton says "how you define what 'is' is"...model year, build year, title year. The only time it really matters is buying parts. 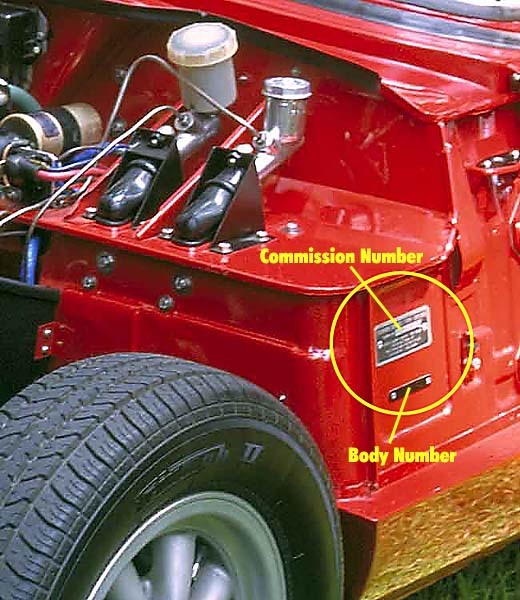 Some parts on the 74 are different from 75's so most parts suppliers will use your Commission number rather than the car's year.